While I have completed the Planche release trick in two positions before, Saturday was the first time I tried a Back End Planche on the Trapeze. In this advanced version, you have to move into the plank position in one motion at the back end of the swing. 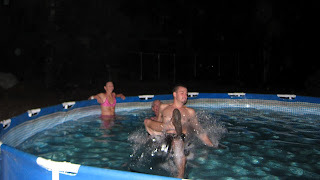 I couldn't attempt it until I first learned the warm-up swing to a satisfactory level. I have also been practicing the Birdie for a few weeks now, throwing it to the net, but yesterday Wayne caught it for the first time. Since I am tall, I call it the Albatross instead. I was a bit nervous about the catch so I forgot to squawk out my bird call as I swung forward. After class, Tori taught me how to lock my legs on the Catch Bar. I can't wait until I learn to catch one of her tricks. 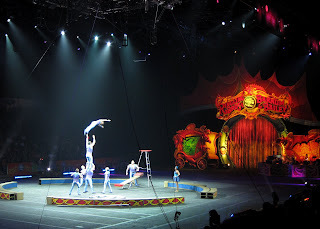 Saturday night, Tori and I met Dave, Lindsey and the rest of the group at the San Diego Sports Arena to see The Flying Caceres trapeze act in the Ringling Bros. and Barnum & Bailey Circus. 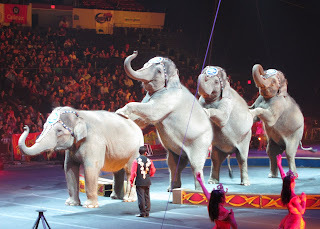 I haven't been to the circus since I was a child, so I was pretty excited. The trapeze act was very cool with a double-decker rig where they performed bar-to-bar tricks that I have never seen before. 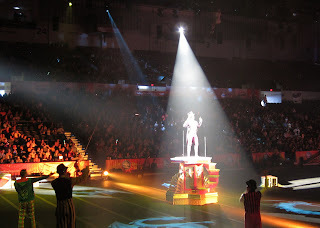 It was a great show with lots of "Wow!" moments. 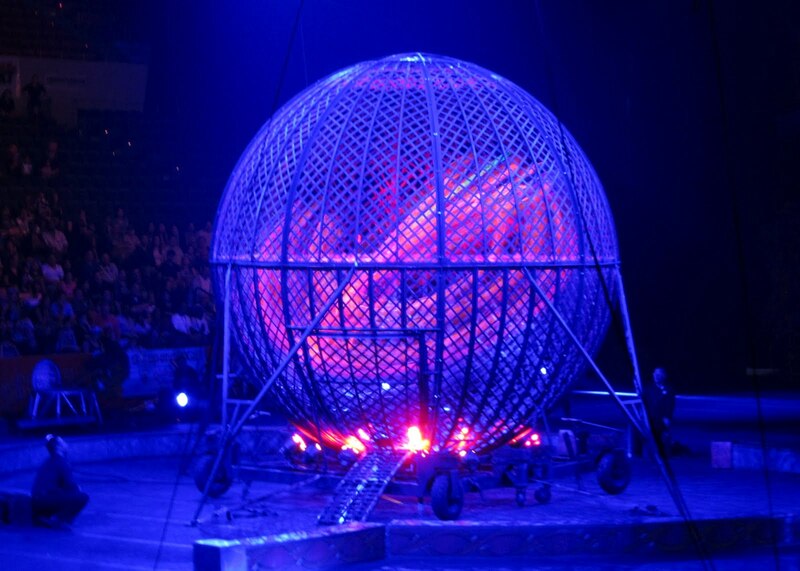 Stunt Horse-Riding, Aerialists, Acrobats on the Teeterboard & Russian Bar, Martial Arts and even eight motorcycles speeding within a 16' Steel Sphere at the same time. 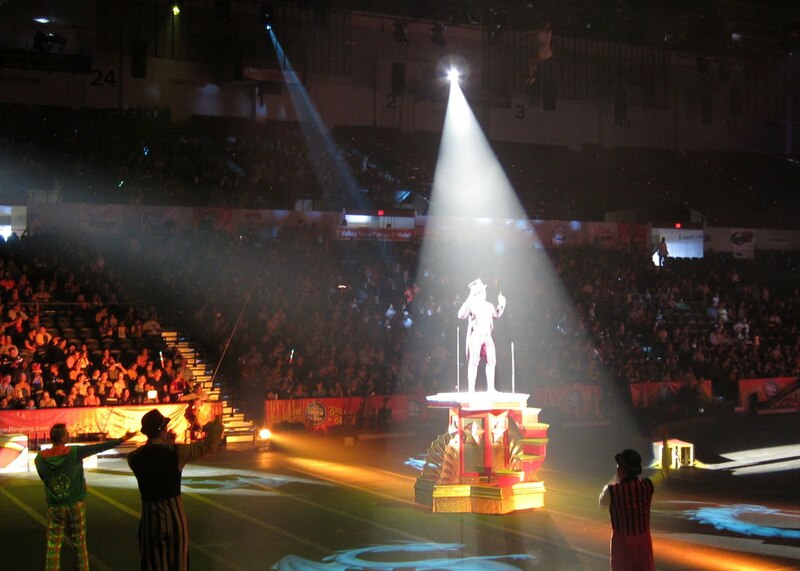 I especially liked the Specs when the circus floor would flood with a sea of performers, dancers, clowns and animals in colorful costumes. 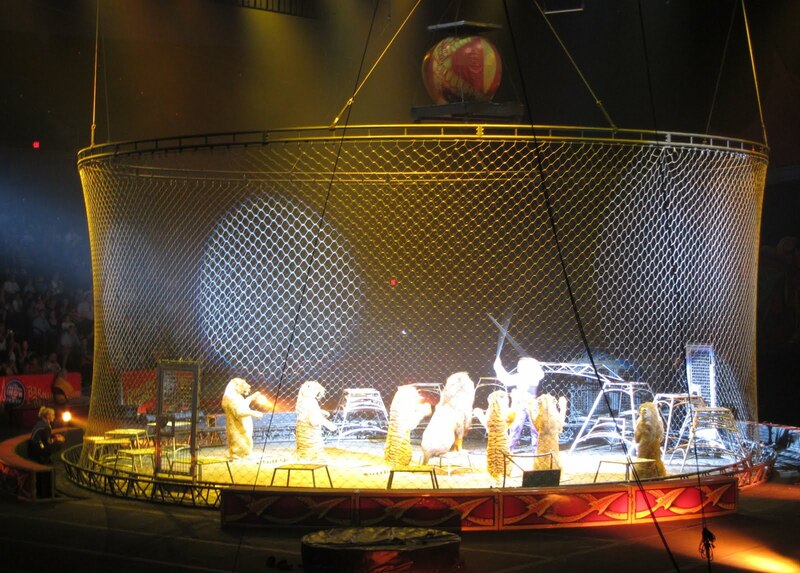 Beside the stunt horseback riding, there were several other animal acts including the Elephants, Lions, Tigers, Ponies, Mountain Goats and Dogs. Funnily enough, one of my favorite acts was just watching common house cats perform tricks. I have now participated in five Midnight Madness Bike Rides around Downtown San Diego. This year, friends from work were dressing up for the event so Tori and I wore tutus. I planned to accessorize mine with a hockey costume, but I only wore the pads because it was too damn hot for the jersey. I was interviewed by Fox 5 while we were waiting for the ride to start, but I don't know if it made it onto the news. This is the first year that the ride started at 9pm instead of midnight which I think that is a bad idea. 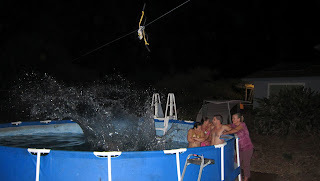 The event loses some of its special madness at the earlier time. I was riding an old rusty cruiser this year instead of my road bike so I didn't mind that they also shortened the course from 18 to just 12 miles. 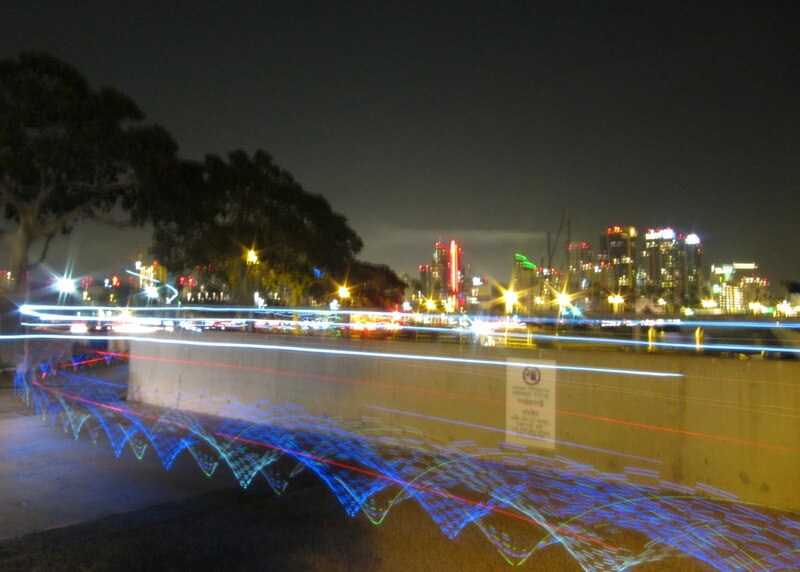 Riding along the harbor, my favorite photo was from when I stopped to take a 15 second exposure of the riders pedaling past. 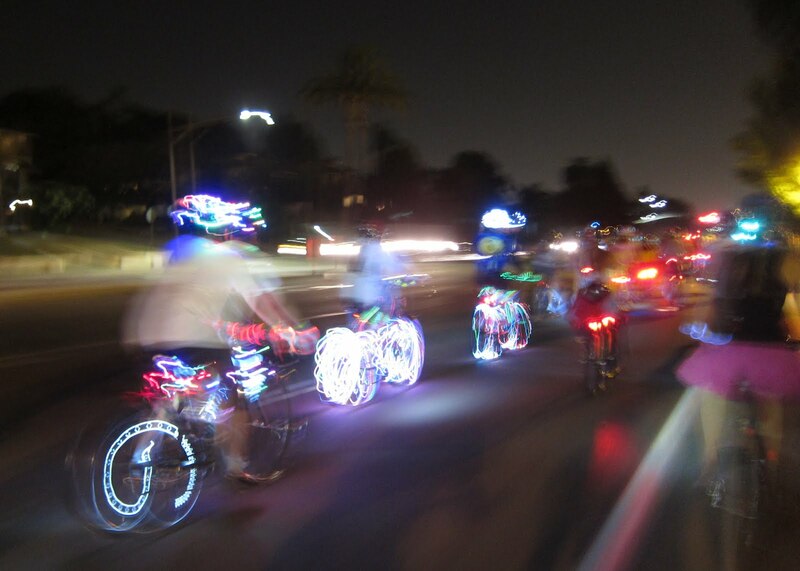 Except for the light trails from their illuminated bikes, the participants were invisible against the city backdrop. Spectators really liked my Hockey Pads-Tutu combo. 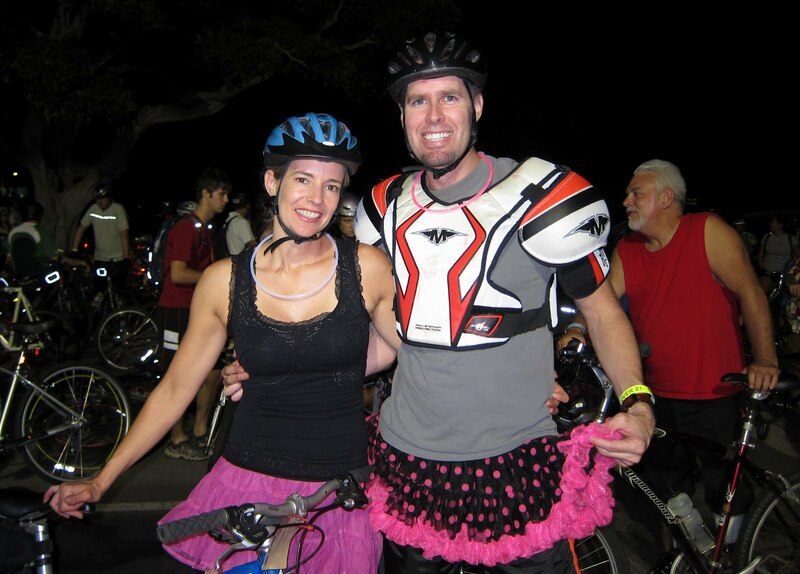 Throughout the ride, I kept overhearing, "That guy's wearing a tutu!!" 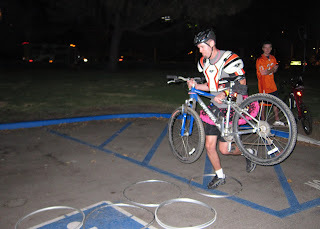 At the end of the ride, I attempted the Bicycle Hopscotch set up at the finish line. 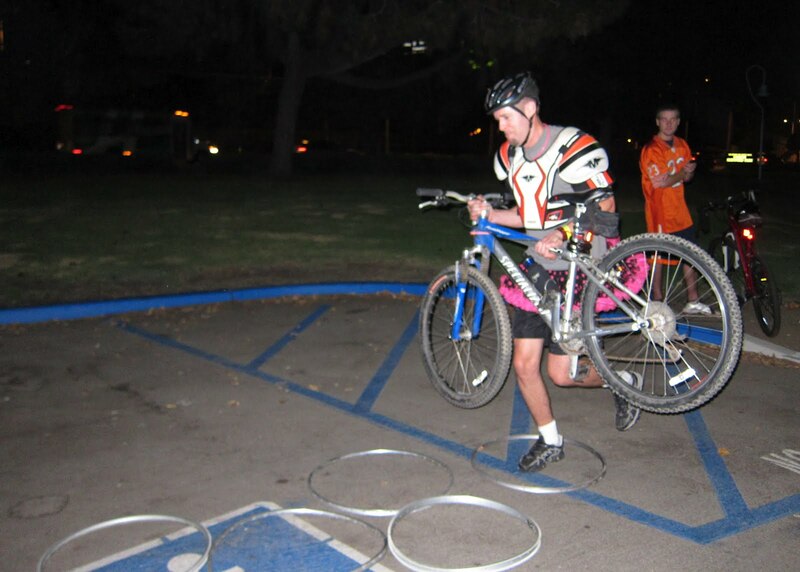 (Hopping through wheel frames while carrying a bike, picking up a smaller wheel and than hopping out backwards.) It was a lot harder than I thought. Our group, "Drinking Team with a Cycling Problem", went over to the Beer Festival tent afterwards, but it was too humid and crowded inside so we didn't stay long. 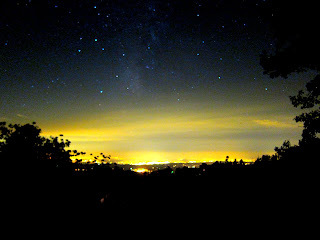 Tori and I drove up to Palomar Mountain last night to observe the Perseid Meteor Shower that originates from the direction of the Perseus constellation. We arrived at the summit after midnight when the constellation rises above the horizon. In less than a half hour of watching, we saw more than 10 meteors shoot across the sky. 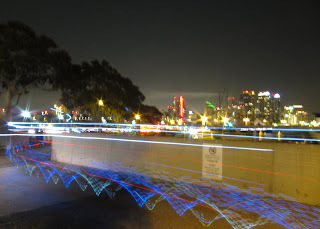 I took this picture of the city lights reflecting off the lower altitude haze with a 15 second exposure on my compact Canon S95 camera. 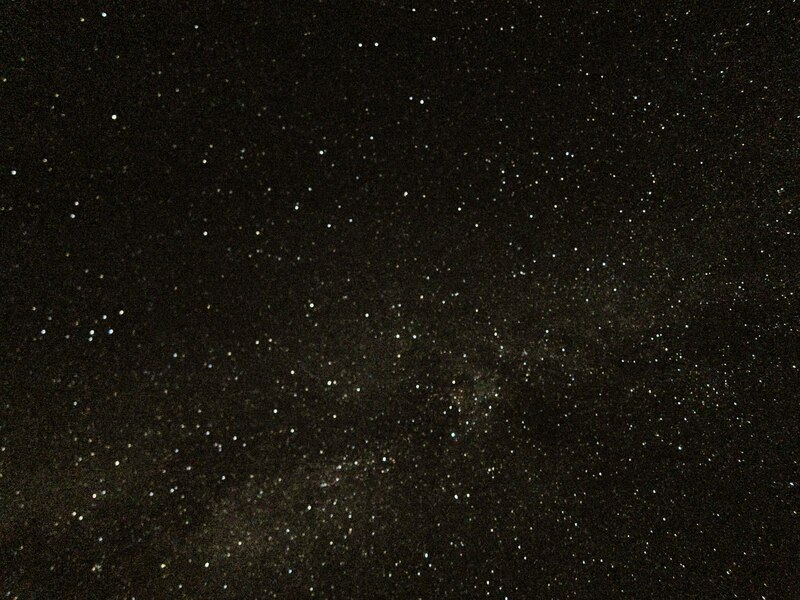 You can see the stars shining above with the dense whiteness of the Milky Way at the center. 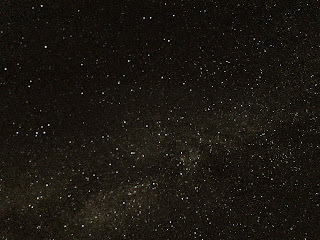 This picture is of the stars directly above our heads. I took several 15 second exposures hoping to capture a passing meteor. No such luck, but you can see the thicker band of stars from the Milky Way Galaxy running through the center from the lower left hand corner. The picture below shows a lovely view up my nostril as we stare up at the sky and count meteors from our beach chairs. 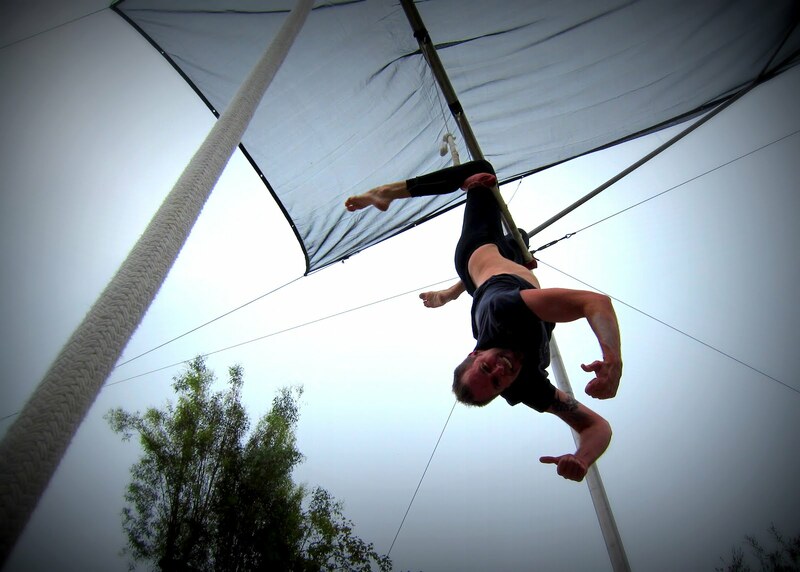 There was birthday party for Chris at Trapeze High on Friday. 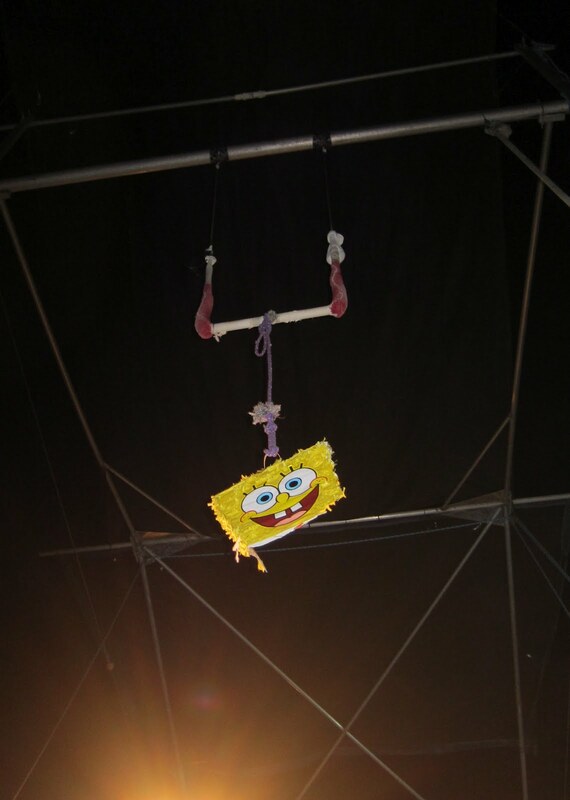 Everyone who knew how to catch was taking turns catching his tricks on the Trapeze. After the cake and birthday song, we hung a Sponge Bob Square Pants Pinata from the Catch Bar. 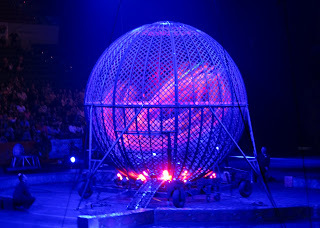 Chris swung out and launched through the air, destroying it with his feet on the first try. 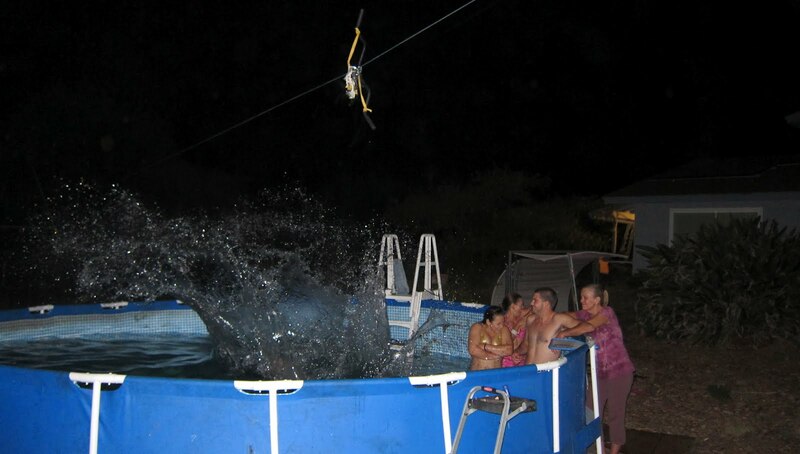 After flying, we started playing on the trampoline and the zip-line that traveled down to the above-ground pool fifty feet away. Since I didn't bring shorts, I stripped down to my underwear. On Saturday, we went to Mark's Masquerade Party for his housewarming. 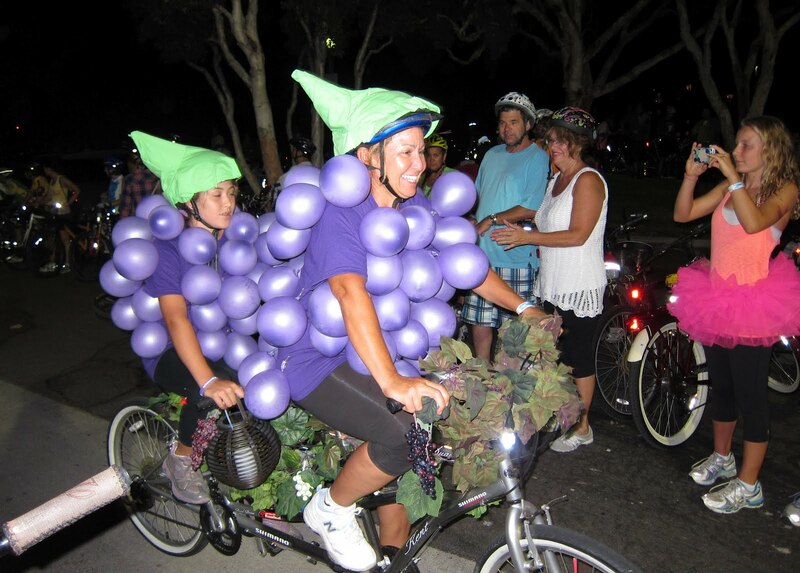 It was the middle of a heatwave with no air conditioning so we were boiling in our costumes out in Escondido. Mark is a great cook so he made lots of delicious appetizers. My favorite was the Nutella, Brie and Basil Sandwiches. After filling up on food, we had a fun time playing Reverse Charades. The Orange Cardamom Ice Cream we ate for desert was amazing!!!! 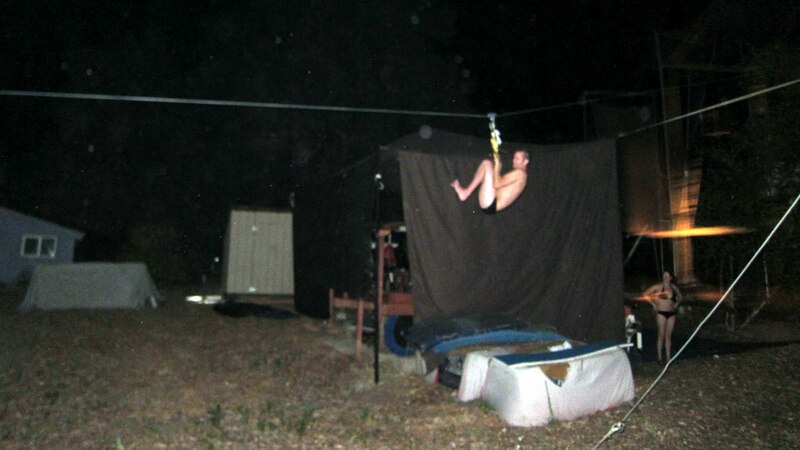 The first night we met, Tori claimed that if I flew on the trapeze rig where she works, she would be able to catch me.